The Greek text on the website is taken from the Perseus Project, which digitized the original, out-of-copyright edition of Heiberg (Leipzig 1883–8). The revisions by Stamatis are minimal, and the text itself hardly differs from that of the 1883–8 edition. Throughout the Greek text the English colon (:) has been used instead of the Greek anō teleia (·). The cross-references given in the English translation are Heath’s own. On the rare occasions where it was necessary, the Perseus Project’s Greek and English texts have been corrected and supplemented using hard copies of Heiberg–Stamatis and Heath. 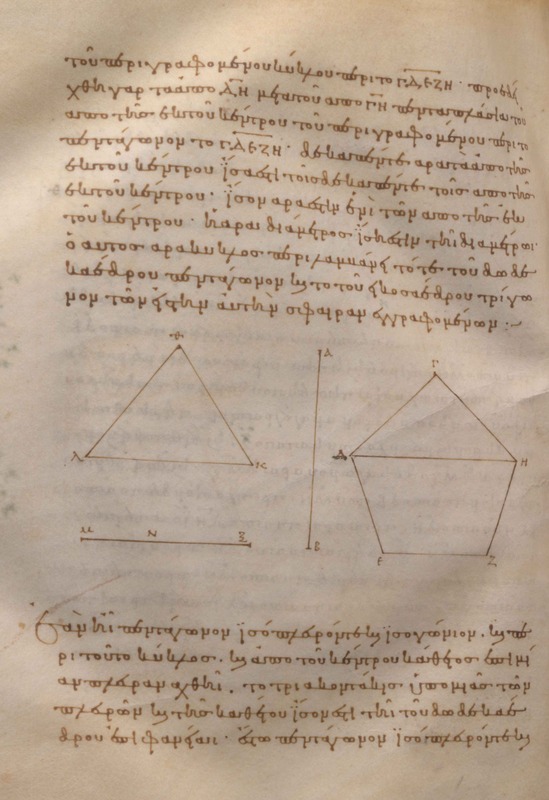 The text written in the manuscript does not precisely match Heiberg–Stamatis, but the divergences are generally not great. Readers who are concerned to know precisely what our manuscript reads as against the rest of the tradition must consult the apparatus criticus of Heiberg–Stamatis (where the siglum given to D’Orville 301 is B). The scholia in our manuscript are not transcribed on this website, nor is material that is relegated by Heiberg–Stamatis to an appendix. However, if this supplementary material is written in the main text-body of the manuscript rather than in the margin, a reference is given (in the ‘Textual Notes’ box of the relevant text-section page) to the place in Heiberg–Stamatis where a transcription is to be found. Heath = T.L. Heath, The Thirteen Books of Euclid’s Elements, 2nd edn., 3 vols., Cambridge 1926. Heiberg–Stamatis = Euclidis Elementa, post I.L. Heiberg edidit E.S. Stamatis, 5 vols. in 6, Leipzig 1969–77.